Having re-acquainted ourselves with the New Forest last September, courtesy of waiting on things medical, we had rather optimistically booked ourselves into a year-round campsite there for New Year. 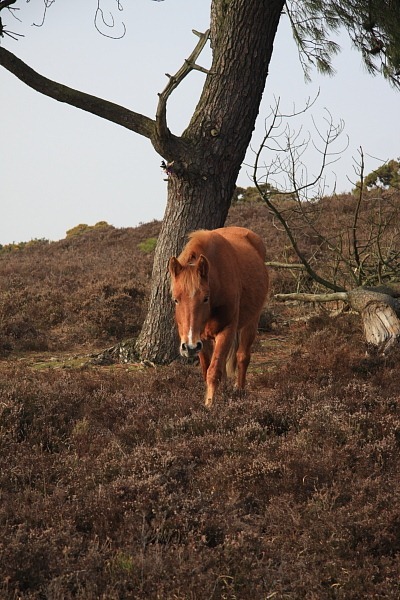 New Year in the New Forest: seems almost poetic. At the time of making the booking, I was expecting some temporary incontinence but I was still thinking stress incontinence. As we now know, the level of it was rather more severe following my prostatectomy on 2nd December. In the light of our more complete knowledge, we rearranged our booking for late March. There was, as it turned out, an additional problem at New Year: snow. Towing a caravan/trailer down to the New Forest in snow would never have been an enjoyable or, indeed, sensible task. When it came to the re-arrangement we lucked out. We went down a few days early and arrived in stunning (for March in England) weather. Traffic was light and the sun was shining – the journey was a dream. With the exception of one day, the run of glorious weather continued for the 12 days of our stay. Unhappily, I wasn’t the only attendee with a damp problem; our caravan, Billy, has come out in sympathy to show moral support. At his recent service, the “engineer” reported the beginnings of water ingress in his near-side rear quarter. If that wasn’t enough, he’s leaking water back out of the pressurized on-board water system into the external container. I know exactly how he feels! I’d just as soon he wasn’t showing quite such a level of support, however. I wouldn’t normally think that visiting an essentially broad-leaved deciduous forest in winter would be so enjoyable but enjoyable it was. With no forest canopy, all the ample sunlight was filtering through the bare branches of the trees and hitting the forest floor. Additionally, the forest floor’s undergrowth (largely bracken) had died down for the winter and was dormant so the views through the well-lit trees were very good. Of course, different weather would have produced a different story but it was all very pleasant. We were there over the theoretical beginning of spring and the wildlife was beginning to wake up to its spring tasks. We had plenty of bird life around our pitch feeding on feeders we had taken with us (for the first time). Expecting the forest tracks to be quite muddy, we had armed (legged?) ourselves with Wellington boots and indulged in several nature rambles of 3-4 miles or so. I wasn’t quite as watertight as the Wellies but any leakages were not severe enough to stop the enjoyment. 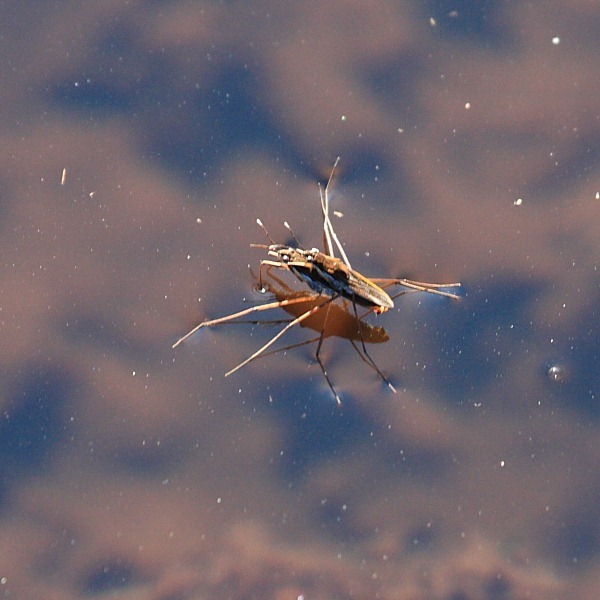 The nature highlights were the year’s first butterflies emerging in the form of the sulphur-yellow Brimstones and I managed to snag a pair of Pond Skaters in flagrante delicto, poor things. Actually, I didn’t notice that they were a pair in a passionate embrace until I loaded the shot on my laptop back at Billy. It’s amazing how blind I can be staring through a view-finder. The low point was being attacked by a New Forest pony. Commoners have grazing rights and their ponies, plus a few cattle, wander about essentially freely. The ponies are quite famous and are usually very placid, though tourists are requested not to interfere with them and advised to give them a respectably amount of space. In this case, we were giving the pony in question a wide berth but it took it into its head actively to pursue me. It crossed about 60ft/20m of open ground to get to the path down which Carol and I were walking and followed us down the path before turning its rear-end towards me and lashing out twice with both hind legs. The first kick missed but the second was more successful and made contact with my right hip, fortunately only relatively lightly. Had it been my stomach, I’d have been less philosophical about it, I suspect. We’d taken our bicycles, too, and tried our first post-operative bike rides of any real note. 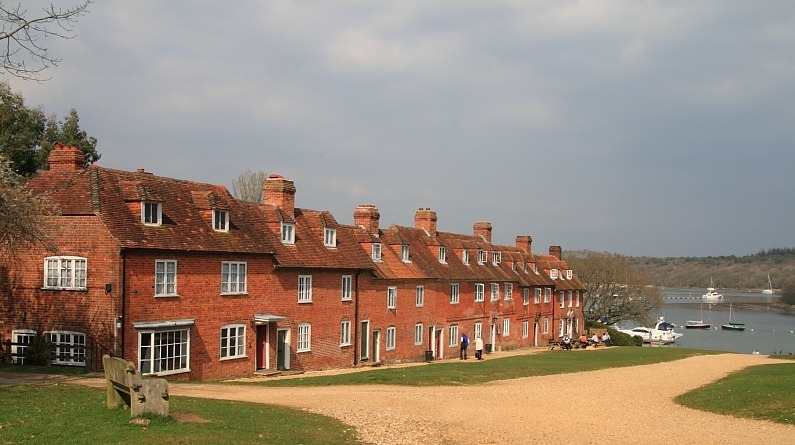 We started with a quite modest 8 miles but very soon thereafter indulged in a 27-mile round trip to Bucklers Hard, an historic 18th century ship building village. Several ships for Admiral Nelson’s fleet were built here from oak trees felled in the New Forest. Since one galleon required about 2000 oak trees, I began to see why there are tracts of forest with no trees at all. 😉 Such were the delights of the unseasonal spell of weather that we also cycled to the south coast to enjoy a seaside ice cream, as if we weren’t taking in enough calories in the form of alcohol. (It’s completely unfair that alcohol contains any calories at all.) Not only did we find a particularly splendid ice cream but we were also entertained by a gaggle of paragliders drifting back and forth along the cliffs of Barton-on-sea while we ate it. Paragliders make a wonderfully colourful photographic subject, especially against a clear blue sky. Thanks for your brilliant blog. I underwent the same operation as you on March 7th and was totally unprepared for the level of incontinence I have experienced. Reading your blog has made me feel not entirely alone and has provided us with many laughs and added incontinence when reading about your experience with i-Pad Manos. Here in Cornwall I have a questionnaire to fill in before I can be provided with 4 incontinence pads a day – questions include “Have I recently given birth?” and I also have to weigh a dry pad and then the wet ones for three days to see how much I am leaking!!! Isn’t life fun. I have my Psa test in 6 weeks time and the consultant appointment in 7 weeks to discuss the results – I am hoping for an outcome like yours. Best wishes and thanks for sharing your experiences – it has helped me a great deal. Malcolm.